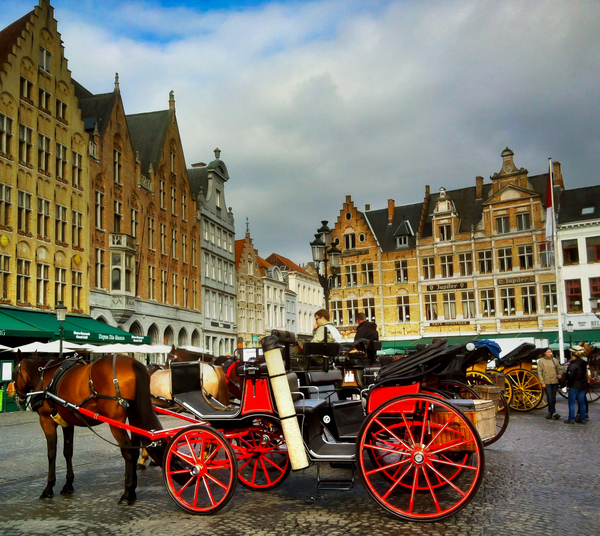 Burg Square and Market Square, with its red horse-drawn carriages ready to drive tourists for a romantic tour of Bruges, are bustling with people. They’re both beautiful squares, but a little too busy for my taste. After a little while, I decided to go far from the crowds and start strolling along the tiny cobblestone streets. Only a few steps away I felt like in a different world: quiet and silent. 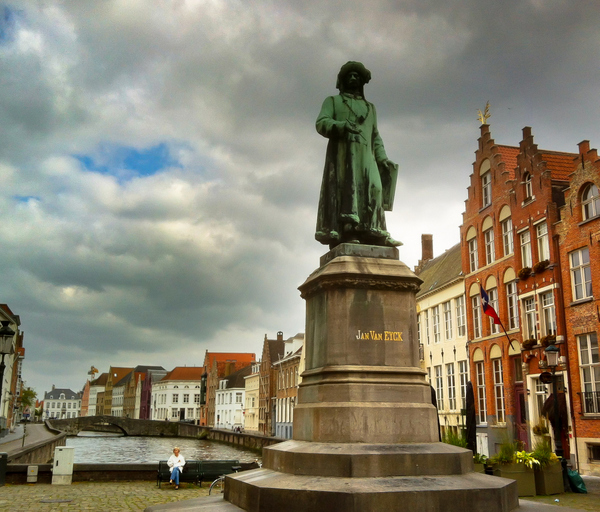 I continued my walking tour of Bruges and reached Van Eyck Square, with the big statue rendering homage to the great Flemish painter, considered one of the most important artists of the 15th Century from Northern Europe. I stopped here for a while, admiring what is one of my favorite corners of Bruges, trying to retrace with my mind some of the most beautiful paintings by Jan Van Eyck. I walked slowly, admiring the houses. Built in yellow and red bricks, with the characteristic high rooftops shaped like steps and the sober decorations, the houses are just beautiful. The sky was stormy, throwing a beautiful light both warm and cold. All of a sudden, I stumbled into the Museum of Chocolate. I couldn’t help but stopping for a visit, during which I discovered the fascinating history of chocolate, from the origins in Mexico to Flanders. 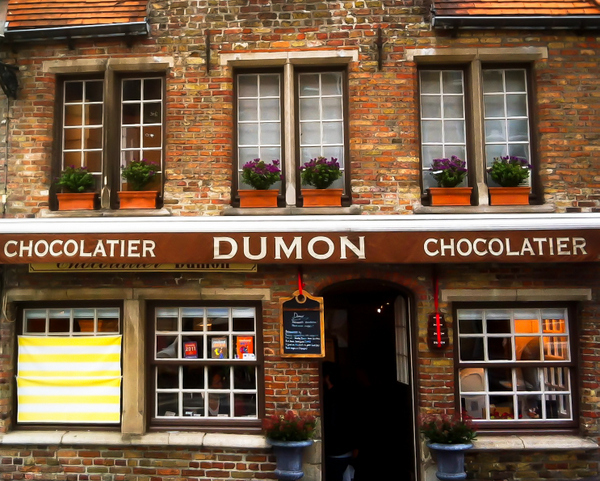 After all, chocolate is what Belgium is most proud of! 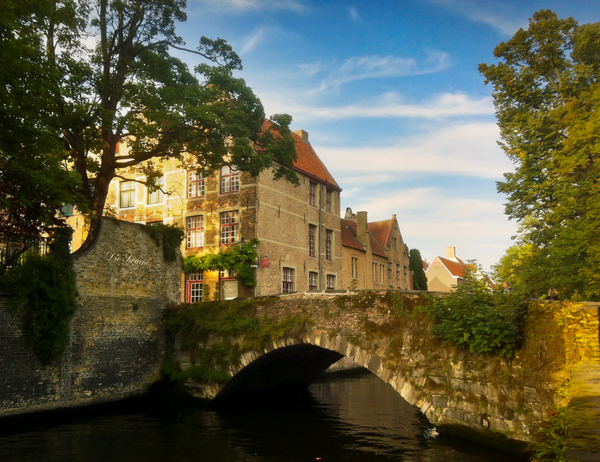 No tour of Bruges would be complete without a tour by boat along the canals. I waited until late afternoon to avoid the crowds and enjoy a better light. Possibly one of the most touristy thing one can do in Bruges, it’s still worth doing as it offered a different perspective of the city and a gave me a few ideas of spots to visit later, on a further solitary stroll. 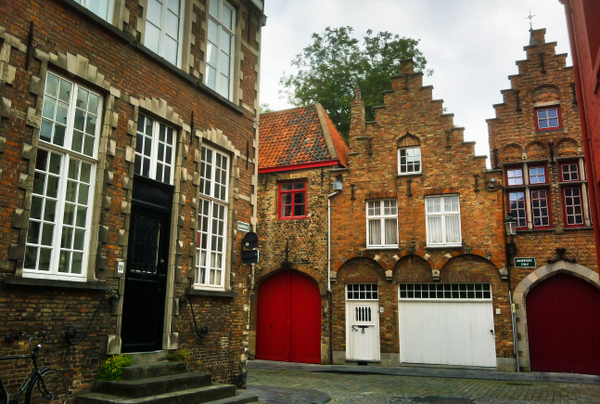 The following morning, I ended my walking tour of Bruges by strolling along the canal heading to Begijnhof, the area enclosing the Béguines monastery. 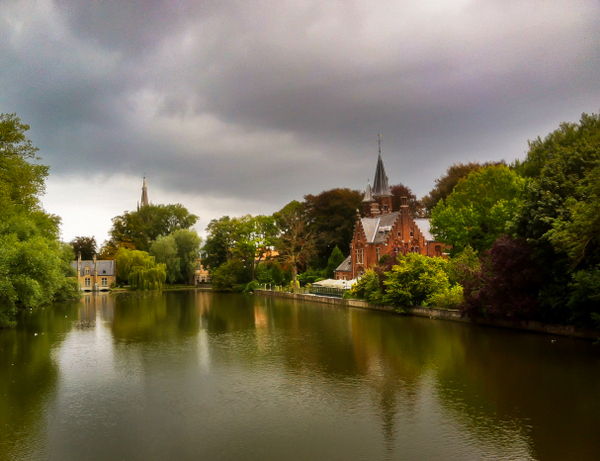 Yet another beautiful view of lovely Bruges, this time peaceful and somehow timeless. would love to hop on a boat to take that tour. such lovely photos you have there. i wish I can experience that place too someday. thanks for sharing! I made you at Bruges? I’m so glad about it. It’s a beautiful city, one of the most enchanting in Europe! 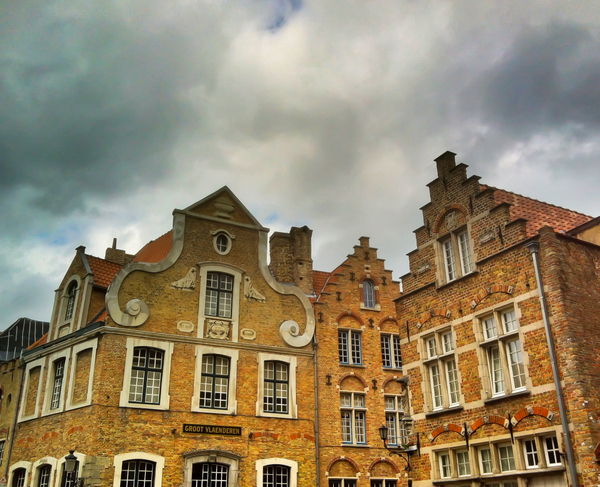 I loved Bruges and really want to go back to Belgium to see more of the country. Beautiful! I hear so much about Bruges, I always wonder if it can live up to the hype. My guess is that it does, and after seeing this post, I feel more validated in that opinion. It’s on my to-do list when I return to Europe. 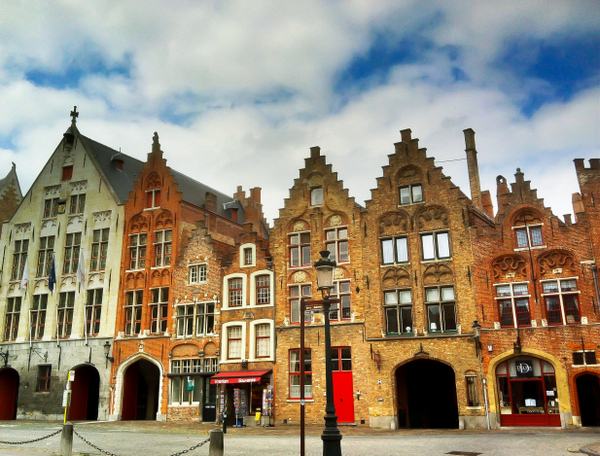 I’m sure you’ll love Bruges, especially if you’ll have a good day. It’s touristy but still charming, and as soon as you leave the most popular areas, you’ll enjoy calm and beautiful tiny streets with awesome views. Bruges is on my “to do” list so thank you for sharing your tips and the pictures. Looks like a beautiful way to spend some time in a city. I always love a boat tour. Any tour with such a beautiful backdrop combined with chocolate is sublime. You should go back, if you have the chance, Heather. I really fell in love with Flanders and was not expecting the cities being so incredibly pretty.